1:00 am - I put down my book and try to sleep. 4:00am - Startled from a weird dream/thought/a barking dog, who knows, I wake up. I know what's coming now. I find myself unable to stop it. I feel unrest, a buzz in my brain and difficulty in breathing. I toss and turn in my bed to try to fall asleep again but find little success. A tidal wave of worries hits me now. Some are severe worries for me. What if I come across as a complete fool in my meeting tomorrow? Am I going ever to lose weight? Some are stupid. Did I forget to close the window? I think it may rain any moment now. Hello everyone! I am sure you must have guessed, I am an anxious person. I don't remember exactly when in my childhood I started feeling this way, and the intensity of my worrying fluctuates, but it is always there. Lately, I decided to do something about it. I know it stops me from accomplishing things I dream about. Ironically, these are the same things I worry about as well. So, I started watching Crazy ex-girlfriend on Netflix. No that's not the fix. I am taking therapy online and offline. But I needed something light after watching Sharp objects and Patrick Melrose. I procrastinate a lot and consequently, watch a lot of shows. 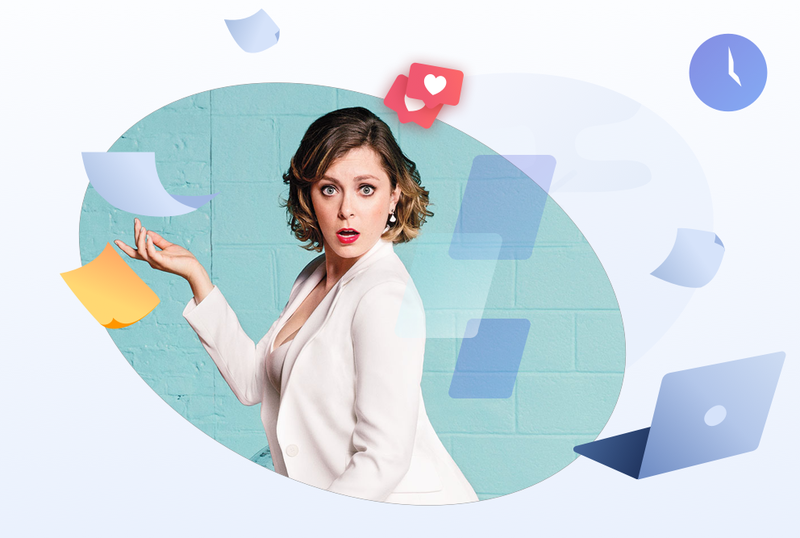 Crazy ex-girlfriend is a musical comedy show. All characters break into song now and then. Sounds, yuck! I know. I refrained from watching it for over a year. The main storyline is about this crazy ex-girlfriend Rebecca Bunch who is a big shot lawyer in New York but is unhappy. One day, she spots her ex-boyfriend from summer camp. He is from West Covina, California and is now planning to move back home. She decides that this is a sign and that she should also chase Josh Chan and move to West Covina to be happy. Subtextually, It is about Rebecca's journey to understand herself and deal with her mental health issues instead of depending on the boyfriends in her life to find her happiness. It also has a group of strong women supporting each other which is just great! SPOILER ALERT! It gets easier to talk about how you feel when you talk about how you feel with your friends. There is a scene in Season-3 'Josh's ex-girlfriend is crazy' episode when thanks to a file Josh gave to her friends, they are aware that Rebecca was briefly institutionalised following a scandal years ago involving her ex-lover and Harvard professor Robert Donnelly. Rebecca storms out after being nasty to her friends when they come to offer her help. Some distance away, Rebecca goes to a youth hostel and shares a room with a Danish traveller named Jarl. They bond over a mutual love of the stalker film “Swim Fan” which inspires Rebecca to torment Josh. Here is some dialogue from one of the conversations that Jarl has with Rebecca. Rebecca - "No, that's not how my movie has to end? I am independently financed in my own mind. This story is not about big evil revenge. This is about retribution and redistribution of misery. Making Josh feel like I felt my whole life." Jarl - "Wait, you were unhappy before you met him? Then, how is this his fault?" Rebecca - "What, he exploited this unhappiness? He took his normal and rubbed it in my face." Jarl - "So, what I am hearing is this is not about Josh, per se. Josh is more a symbol of effortless normalcy from which you always felt excluded. Eureka! This is the root of my anxiety. I am always trying to gain this magical effortless normalcy. Effortless normalcy for me comes from being good at everything. Work - I should be good at coding, designing, sketching, marketing, customer support etc. I have a startup. Body - I need to have a body like Valencia's from Crazy ex-girlfriend to feel normal. Hobbies - I want to have my comic strip one day with beautiful characters and funny stories. "I want to do and be good at a million things in life. I fear my life would be worthless otherwise." Just like Rebecca, I had to explore this in therapy and work with people in this field to condense it in a way where it is actionable. How does my anxiety feel? "It feels like a part of my brain is blocked, and my anxiety monster just lives there permanently with new anxiety babies." It feels like an exhausting voice which would not shut up. It felt immensely comforting to see someone else go through the same problems as me. Like normal people, I have also sent angry texts to my ex. Still, nothing as crazy as what Rebecca does. At one point in the show, Rebecca uses her failed suicide attempt to blackmail an ex-co-worker to do things for her. My therapist and I do not recommend this. After watching the show, I have been more proactive to own up to my actions. Something Rebecca takes a long time, four seasons and 51 episodes, to do. This show talks about mental health in a way which doesn't glorify it but addresses it in a way which is relatable. Just like Rebecca, I am also a good student about my mental health now. Earlier, I could not differentiate one day from another. All I would remember about the day was that I felt fatigued and stressed. Writing a note about my positive and negative feelings has helped me tons. It’s not that easy to do and takes a combination of will and incentives. Collecting data on myself is helping me pinpoint how, when and where I feel anxious or depressed. I try to be as cute or depressing as I can be. Perks of having a private journal! Crazy ex-girlfriend expanded my vocabulary on how I can express myself and how I am feeling. That is gold! When you can describe what is happening to you and break it down into words, you take some power away from your anxiety. Stress melts away a little as now this unknown stressor is a thought or feeling or a physical thing. You also get to know about some things about the worry. For example, I am stressed because I am worried I will never be able to save money. Of course, there is therapy needed to understand yourself further, but emotional intelligence is a good start. I can’t write songs, but I can sing! Lastly, the most useful thing I have learned is to sing when I am stressed. There are 2 or more songs per episode at least. Singing when I am feeling stressed has been fantastic! I am pleased to have no audience. If you can write or sing silly songs like Crazy ex-girlfriend, that is even better than what I am doing which is humming half-remembered lyrics of old songs and filling the rest with la, la, la. So, think about it the next time you are feeling anxious. Are there any shows that make you feel happy or relaxed in a stressful moment? It could also be a movie and not a song that you love to watch or that changed something in you to make your troubled life a little better. Care to share? I could use some suggestions. After all, I am almost at the end of watching Crazy ex-girlfriend.